I am not even finished reading this book - ha ha - but wanted to share how much I am enjoying it. 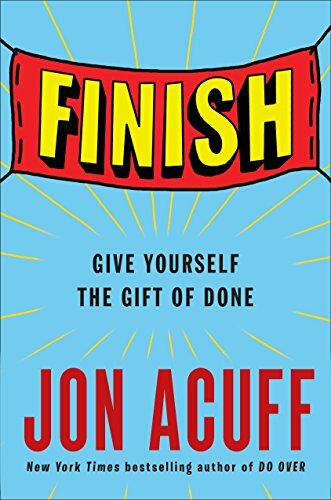 I rarely read non-fiction, because reading to me is my greatest escape, but I enjoy the writing of Jon Acuff. Since I have a couple goals that I can't seem to complete, the book seemed like a good place to start for some inspiration. "The only way to accomplish a new goal is to feed it your most valuable resource: time. And what we never like to admit is that you don't just give time to something, you take it from something else. To be good at one thing you have to be bad at something else. Perfectionism's third lie is 'You can't do it all.' I'm here to tell you that you can't." "You only have two options right now. 1. Attempt more than is humanly possible and fail. (editor's note: done it) 2. Choose what to bomb and succeed at a goal that matters." I feel like I practice this, kind of. But I need to be more deliberative. Sometimes things get bombed regularly because I let it fall off of my plate (gym, vegetables....). Thinking about this concept has made me appreciate even more three awesome groups of fabulous ladies in my life. With them I can "bomb" and it's totally okay. I belong to a book club, a bible study, and a writing group. They all meet only once a month, sometimes less. And what's awesome about all three of these very different groups is that you are welcome even if you didn't read the book, do the next chapter of the study, or write a single new page. It's an accomplishment just to meet regularly, the rest is gravy. I am so thankful! Finish: Give Yourself the Gift of Done is available on Amazon and as an audio book.